Floral decorations are a mainstay of any wedding. If you really love fresh flowers, it can be fun to think beyond the basic bouquets and centerpieces and embrace other forms of floral design. One of the most delightful types of floral arrangement is the pomander - a perfectly round ball of flowers, usually hanging from a ribbon. Take a look at all the wonderful ways you can use fabulous floral pomanders for your wedding. Confession: I love pomanders! There is something so jaunty and cheerful about a big round ball created entirely from flowers. They are almost like giant polka dots for your wedding, and they are also have an old-fashioned charm and sweetness. 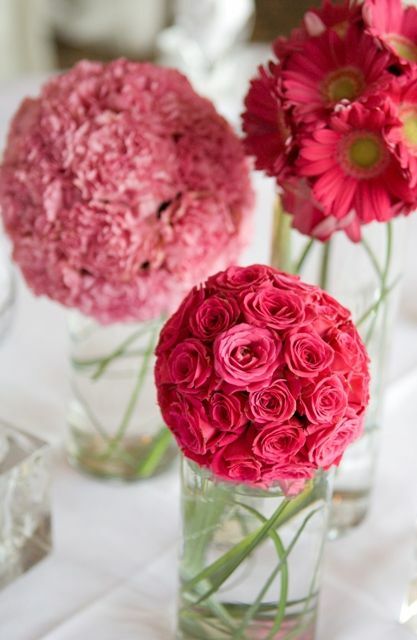 The most popular flowers for creating wedding pomanders are carnations, roses, daisies, and mums. Round blossoms are a must, as are blooms that can be tightly packed together. The flowers are pushed into damp floral foam, but they must be relatively hardy without constant water (like any bouquet flowers), and since they are used en masse, it helps if the blossoms are not prohibitively expensive per stem. For all of these reasons, carnations are the ultimate flower for pomanders! One of the sweetest ways to use a floral pomander in your wedding is to have your flower girl carry one in lieu of a basket. Make a fairly diminutive ball of blossoms so that it does not overwhelm the little girl. It would be lovely to make her pomander from the same blossoms the bridesmaids will be carrying in their bouquets. 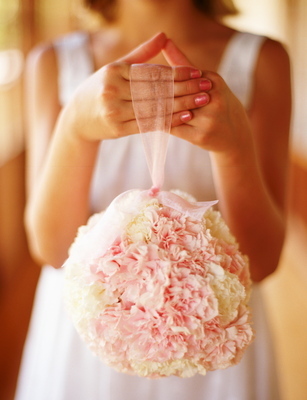 For that matter, you can also consider substituting pomanders for the bridesmaids' bouquets. They should be slightly larger than the one carried by the flower girl. A beautiful idea is to accessorize the pomander to coordinate with the bridesmaid jewelry. If they will be wearing pearl earrings, suspend the floral balls from a rope of faux pearls instead of a ribbon for a very elegant design. Pomanders also make outstanding ceremony decorations. They are especially versatile for an outdoor wedding. 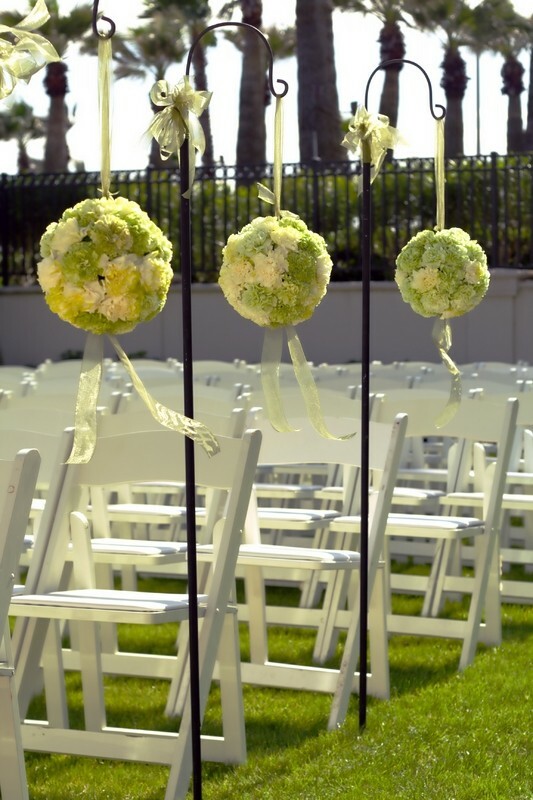 Hang pomanders in several colors from an arbor for a ceremony in a garden. Tie the floral balls to the ends of the rows of chairs (this also makes a beautiful pew decoration for a church wedding). 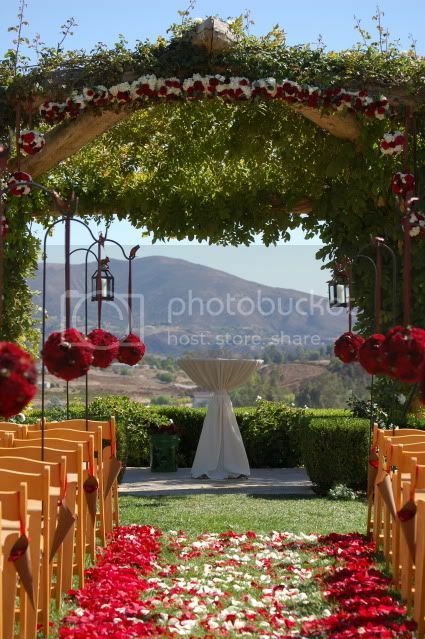 Pomanders look wonderful when suspended from shepherd's hooks planted along an aisle for an outdoor ceremony. Bright colors tend to work the best, as they have a great "pop" when seen from a distance. Hot pink, lime green, yellow, or vivid purple all work beautifully. It looks fantastic to combine two bold colors, such as cherry red and lime green. The great news is that carnations can readily be dyed any color, so if you want turquoise blue pomanders, you can have them. 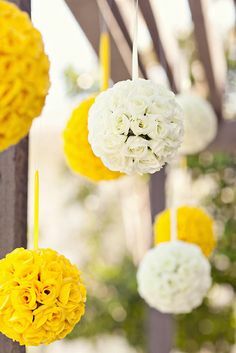 There are some beautiful ways to use floral pomanders to decorate your wedding reception. They look very charming when hung from the backs of the bride and groom's chairs at the dinner table. It is a nice way to make the seats special. The pomanders for the dinner chairs need not be particularly vivid, as long as they do not blend in with the color of the chairs or slipcovers (for instance, white pomanders hung on white chiavari chairs would not have much of an impact). They are usually made from similar flowers to the bride's bouquet, such as pale pink roses. As with pomanders for bridesmaids, it is a beautiful touch to use accents that coordinate with the bride's jewelry. Place pearl tipped hatpins between the blossoms to complement the bride's pearl earrings, or suspend a fabulous crystal tassel from the bottom of the pomander to coordinate with crystal bridal jewelry. Pomanders have many more uses in weddings. They can be strung along porches, placed on stands as centerpieces, or hung over tables instead of chandeliers. If you love flowers and whimsy, floral pomanders might be just what you need for your wedding decorations.